Streuth, G’Day & No Worries. With the Mitsubishi Shogun shortly to meet it’s maker, a new SUV from the brand, the Shogun Sport has been launched to replace it. 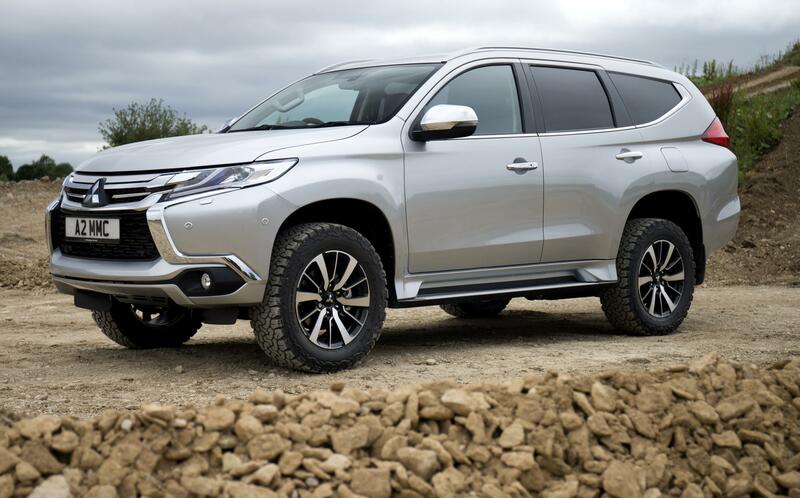 There are rumours that a new Shogun may emerge post 2019, but in the meantime, welcome to the Shogun Sport which is a very ‘Crocodile Dundee’ proposition, having been on sale around the world, including Australia badged as the Pajero Sport. To keep things simple, there are two trim levels, the ‘3; & the ‘4’ with prices starting at £37,465 for the ‘3′ rising to £39775 for the ‘4,’ meaning that both just get in under the 40K luxury tax figure, an important consideration for many. From the outside, the Sport looks like an L200 from the front, featuring as it does the Mitsubishi ‘Dynamic Shield’. Flattened sides & a sloping-to-the-rear roof make it as aerodynamic as a large SUV can be & the rear end features a pair of vertical brake lights that hang down each side like a drooping moustache. The front bumper has been designed to stop water flowing into to the engine & the overall impression is of a vehicle that will happily tackle the Outback. The interior is typically Mitsubishi. We tested the ‘4’ & all of the luxury kit is there, put together in the Japanese way & therefore doesn’t feature the clean lines of a Land Rover Discovery. 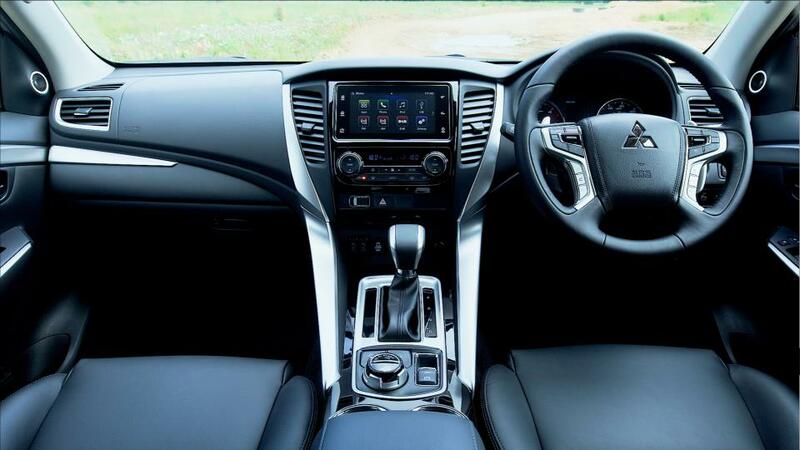 Quality is good, with all of the dashboard plastics of a decent quality, soft touch in places. There’s some cheap looking silver chrome on the dash & some of the buttons are very child friendly, but generally speaking it’s well made. The 2.4 diesel engine, both versions use an eight-speed auto box, offers up 179bhp & 430Nm of torque, with a 0-62mph time of 11 seconds & a top speed of 112mph. Fleet customers need to know that the CO2 emissions are 227g/km & that claimed combined fuel economy is 32.8mpg. Interior space is excellent, with plenty of room for 5 adults in the front & the middle row, whilst at a push, two more will get into seats 6 & 7. 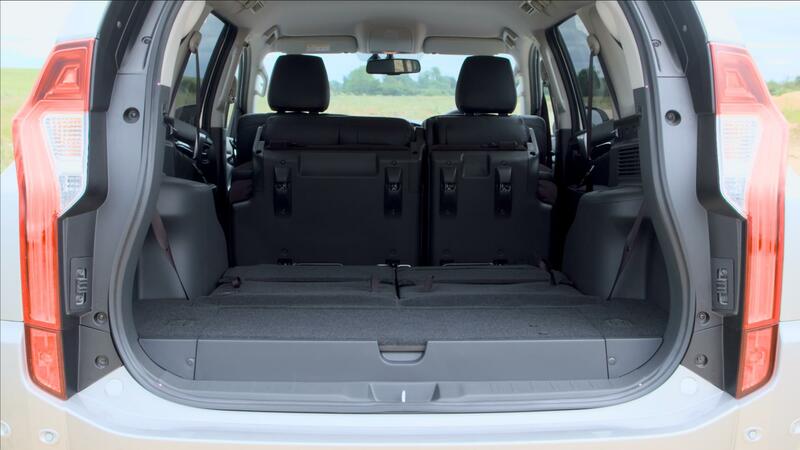 Shogun Sport boot space is also excellent, with 502 litres on offer with 5 seats in place, 1488 litres with 2 seats up & even 131 litres with seats 6 & 7 up as well. Load length is 1827mm & load width between the wheel arches is 1000mm. For those who require it, the Sport will tow up to 3.1 tonnes, so a perfect horse box vehicle. You can also get up to 80kg on the roof & a payload of 600kg on board as well. With an 11.2m turning circle it’s also useful in a tight space. We drove the Shogun Sport on road first, where it’s performance was distinctly average. It’s a large, heavy car & it feels it, especially around corners where it rolls in & out, which is actually quite enjoyable. With passengers in the rear, this should settle it down a bit. Bumps in the road offer up a pick-up like jolt through the bottom of your seat. The brakes are tremendous, as we were forced to slam them on when a tractor appeared on our side of the road. The controls are easy to reach & simple to understand. The indicator stalks are on the right which caused my co-driver & I to tally just exactly how many times we would select the wipers on our route, with myself winning 6-5 after extra time – we drove for approximately 2 hours-. The SatNav reacted a little slowly & we missed a turn or two on the test route. The Shogun Sport features extra sound insulation & vibration damping in critical areas, which does keep the large cabin nice & quiet. The eight-speed auto box is also in on the act, making for relatively quiet changes & forward progression. Wind noise too is also at a minimum. 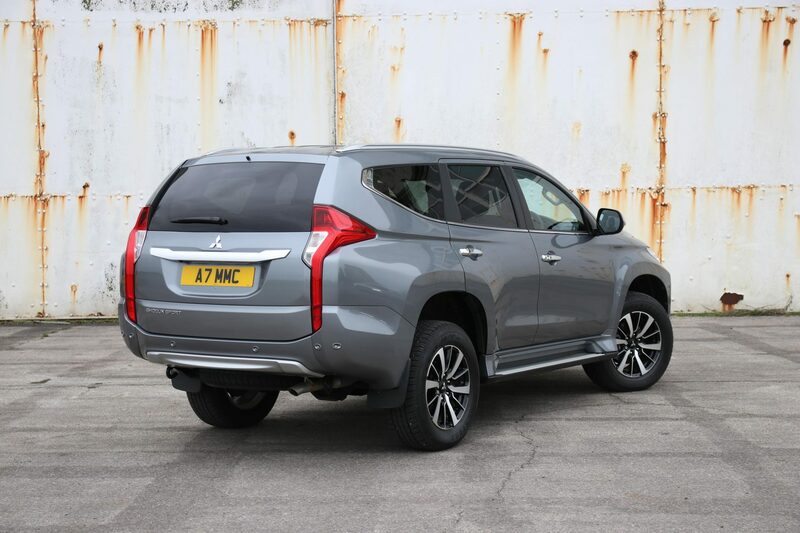 Whilst Mitsubishi see most of the 3,500 projected annual sales, coming from existing customers, they will be hoping that the cars price, interior space & off-road capability may also sway some new business there way. The Sport comes fully equipped for all off-road needs. The different driving modes include Gravel, Mud/Snow, Sand & Rock. There’s also the choice to select form 2H (2WD), 4H – a 40:60 split front to rear, 4HLc – which locks the centre diff to provide the best traction in snow or sand & 4LLc which uses low gearing. You can also lock the rear diff in 4HLc & 4LLc. 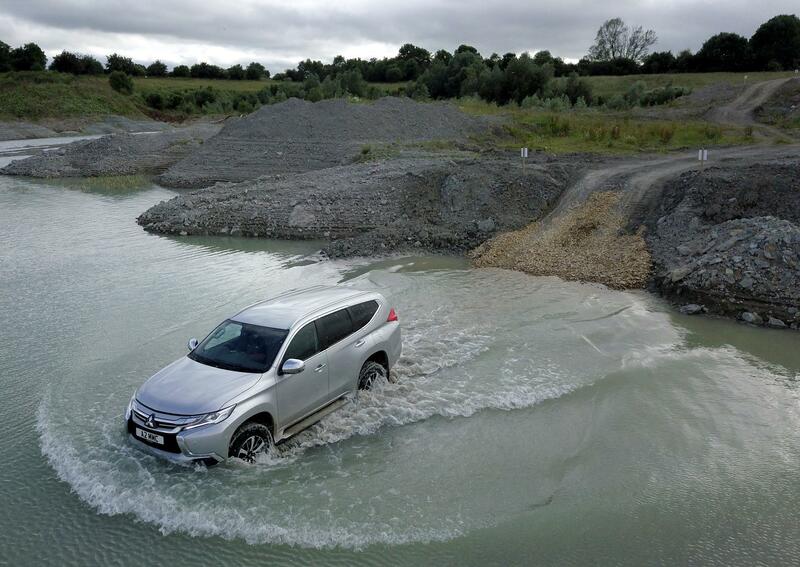 Luckily, Mitsubishi provided us with a specially built & converted quarry near Cirencester to put the Shogun Sport through it’s off-road paces. Apart from extra-nobbly tyres, a cost extra, the standard car took on a mixed route that include gravel, rock, 700 mm of water & plenty of blind climbs. The Shogun Sport features a high ride height & taught overhang with an approach angle of 30 degrees, break over at 23.1 & a departure of 24.2. Our instructor talked us through the course & we were able to test articulation & the quarry water depth of up to 700mm all without issue. The Shogun Sport also features the Super Select II 4×4 system which allows drivers to shift the driveline between 2WD & 4WD on the move at up to 62mph, though accessing the low range of gears via the transfer box is done at a standstill. Time spent off-road was hugely enjoyable & the Sport was very impressive & it really shines when it’s pushed off-road. As with it’s main competition, namely the Toyota Land Cruiser, the Shogun Sport is a better off roader than tarmac dweller. Having said that, it’s not trying to be anything else & it’s appeal lies in it’s practicality, under 40K price & off-road ability. Plainly, Land Rover do on-road better, but that’s not the point, as the Shogun Sport is cheaper & up to a third of Shogun Sport customers will be from the rural sector, where farmers, forestry workers & utility companies want an all purpose vehicle, more in keeping with a Land Rover Defender than a Discovery. It’s in this class, where the Shogun Sport wins. If it’s an on-road large SUV that you want, then KIA & Hyundai offer cars with better road manners. But, if you need to cross the Australian Outback in a cork hat or make your way around any rural region of the UK, then the Shogun Sport might just be your man.